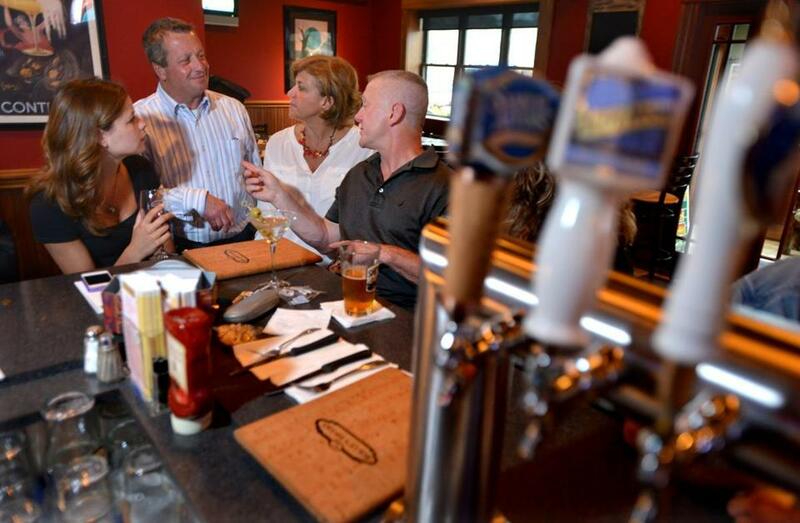 Owners Rolly Hayes and Wendy Meninno Hayes talk with customers Courtney King and Paul Goutro. Stuffed arancini is deep fried. 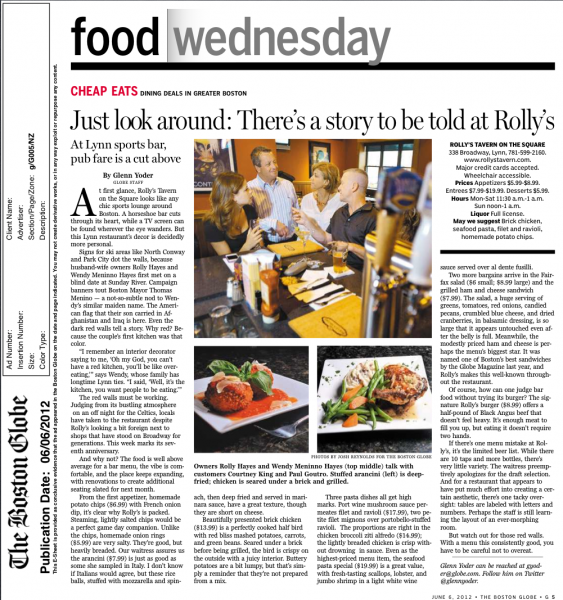 At first glance, Rolly’s Tavern on the Square looks like any chic sports lounge around Boston. A horseshoe bar cuts through its heart, while a TV screen can be found wherever the eye wanders. But this Lynn restaurant’s decor is decidedly more personal. Signs for ski areas like North Conway and Park City dot the walls, because husband-wife owners Rolly Hayes and Wendy Meninno Hayes first met on a blind date at Sunday River. Campaign banners tout Boston Mayor Thomas Menino — a not-so-subtle nod to Wendy’s similar maiden name. The American flag that their son carried in Afghanistan and Iraq is here. Even the dark red walls tell a story. Why red? Because the couple’s first kitchen was that color. The red walls must be working. Judging from its bustling atmosphere on an off night for the Celtics, locals have taken to the restaurant despite Rolly’s looking a bit foreign next to shops that have stood on Broadway for generations. This week marks its seventh anniversary. And why not? The food is well above average for a bar menu, the vibe is comfortable, and the place keeps expanding, with renovations to create additional seating slated for next month. From the first appetizer, homemade potato chips ($6.99) with French onion dip, it’s clear why Rolly’s is packed. Steaming, lightly salted chips would be a perfect game day companion. Unlike the chips, homemade onion rings ($5.99) are very salty. They’re good, but heavily breaded. 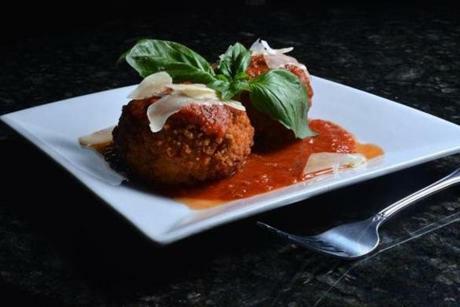 Our waitress assures us the arancini ($7.99) is just as good as some she sampled in Italy. I don’t know if Italians would agree, but these rice balls, stuffed with mozzarella and spinach, then deep fried and served in marinara sauce, have a great texture, though they are short on cheese. 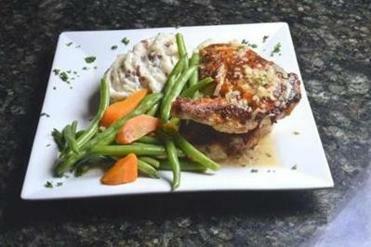 Beautifully presented brick chicken ($13.99) is a perfectly cooked half bird with red bliss mashed potatoes, carrots, and green beans. Seared under a brick before being grilled, the bird is crispy on the outside with a juicy interior. Buttery potatoes are a bit lumpy, but that’s simply a reminder that they’re not prepared from a mix. Three pasta dishes all get high marks. Port wine mushroom sauce permeates filet and ravioli ($17.99), two petite filet mignons over portobello-stuffed ravioli. The proportions are right in the chicken broccoli ziti alfredo ($14.99); the lightly breaded chicken is crisp without drowning in sauce. Even as the highest-priced menu item, the seafood pasta special ($19.99) is a great value, with fresh-tasting scallops, lobster, and jumbo shrimp in a light white wine sauce served over al dente fusilli. Two more bargains arrive in the Fairfax salad ($6 small; $8.99 large) and the grilled ham and cheese sandwich ($7.99). The salad, a huge serving of greens, tomatoes, red onions, candied pecans, crumbled blue cheese, and dried cranberries, in balsamic dressing, is so large that it appears untouched even after the belly is full. Meanwhile, the modestly priced ham and cheese is perhaps the menu’s biggest star. It was named one of Boston’s best sandwiches by the Globe Magazine last year, and Rolly’s makes this well-known throughout the restaurant. Chicken is seared under a brick and grilled. Of course, how can one judge bar food without trying its burger? The signature Rolly’s burger ($8.99) offers a half-pound of Black Angus beef that doesn’t feel heavy. It’s enough meat to fill you up, but eating it doesn’t require two hands. If there’s one menu mistake at Rolly’s, it’s the limited beer list. While there are 10 taps and more bottles, there’s very little variety. The waitress preemptively apologizes for the draft selection. And for a restaurant that appears to have put much effort into creating a certain aesthetic, there’s one tacky oversight: tables are labeled with letters and numbers. Perhaps the staff is still learning the layout of an ever-morphing room. But watch out for those red walls. With a menu this consistently good, you have to be careful not to overeat. Suggested dish: Brick chicken, seafood pasta, filet and ravioli, homemade potato chips. Hours: Mon-Sat 11:30 a.m.-1 a.m. Sun noon-1 a.m.